Here we go again. A long season of juggling family, deployments, and training for the biggest event of the year, the Marine Corps Marathon (a.k.a. The People's Marathon). I know it's not easy to understand that someone considers punishing his body with 26.2 miles of running while weaving in and out of a crowd of 30,000 runners as being the biggest event of my year. My fellow Marines know it takes a "different" type of person to be willing to deploy into harms way without being told to. I live by a different set of rules I guess. My mantra is "If not me, then who?". My comrades think it's plum crazy for me to spend the couple hours of free time I have "paying the man" a.k.a. pounding the pavement. Every morning I get the questions; any races coming up? how far you going today? was that you I saw last night at 2300 running around the camp? Okay for all of you that haven't been following my mission. It's simple really. There are men and women that stick their neck out on the line every minute of every day. Unfortunately, they get hurt more times then not. 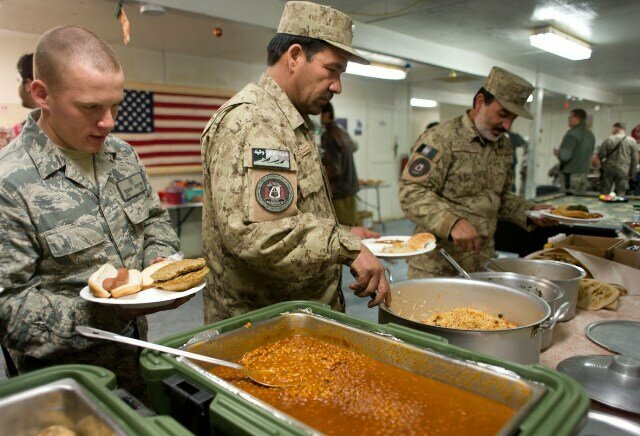 The U.S. military does an AWESOME job taking care of us. We get hurt and we get the best medical attention available. That's not what this is about. I would like to give you a couple of examples how my mission and your donations are contributing. Then I need you to do your most generous part and help me help them. One of my Marine Corporals was injured in an improvised explosive device (IED) attack when he dismounted. He was married to a young 19 year old. His Mother was a waitress in Chicago and was making ends meet with his help. He was stabilized in a medical facility in Germany. At the time we were unsure he would make it. Mom and Wife could not afford to fly to Germany and get a hotel, food, etc... the Injured Marine Semper Fi Fund (IMSFF) stepped in and footed the bill lock, stock, and barrel. No questions asked and no repayment accepted. My Corporal is now recovered and is a Father. Mom is doing well also. How did IMSFF do this? Donations, Donations, Donations! Sgt B was one of my most humble and sacrificing Marines. He was medevac'd the first time (yes the first time) from a vehicle borne improvised explosive device (VBIED). He spent 18 months in a burn center in TX. IMSFF payed for his Mother to visit for a week or so at a time. The second time Sgt B was medevac'd he had been shot twice. Multiple surgeries and months later in 2 countries and 3 states, IMSFF reached out to Mom and moved her with him. Again no money repayment asked. Sgt R was shot by a sniper in his forehead. The bullet penetrated his helmet and was lodged in his brain. He was given zero chance of survival. I was speaking to the doctor before they conducted emergency surgery. He is an amazing surgeon. He said to me "Jon, your man is in bad shape", I told him "Doc do what you were put here to do and save his life!". He did and last year Sgt R raced in the Marine Corps Marathon on a hand bike. Yep, a hand bike. A hand bike is a wheel chair racing bike. After surgery the Sgt needed a therapist to help him learn to use his arms again. A nurse 24 hours a day to live at his house with him to care for his needs. Home remodeling for his future wheel chair. I could go on and on. Tens of thousands of dollars he and his family did not have. You guessed it, the IMSFF was there. I have the easy part. I run for team "FOR THOSE WHO CAN'T". I represent thousands of men and women heroes from our U.S. military that need your help. I don't care if it is a dollar or a thousand dollars. I will earn every penny on 30 October when I toe the line in Washington D.C. Please go to the below link and donate. If not you, then who? Ms Marti has pledged to match all donations made between October 12th 2011 and the completion of the Marathon, up to $1000.00, so your donations are worth twice what you contribute. FORT HOOD, Texas -- When Staff Sgt. Benjamin Westrich won third place in the lightweight division at the 2011 U.S. Army Combatives Championship here July 23, it meant more to him than a plaque and a handshake. It meant much more for many people. Westrich, an Individual Readiness Training instructor at Fort Carson, Colo., competed for Command Sgt. Maj. Frank Socha, the senior enlisted leader of the 10th Special Forces Group who has been battling late-stage lung cancer for more than a year. Westrich first learned about Socha's plight when the 10th SFG combatives team combined with the Fort Carson team in preparation for the tournament. PUERTO QUETZAL, Guatemala (NNS) -- Military Sealift Command hospital ship USNS Comfort (T-AH 20) and Continuing Promise 2011 (CP11) departed Guatemala, July 11, after 10 days of medical, dental and veterinary care, engineering support and subject matter expert exchanges. Comfort's crew manned three medical and two engineering sites spread around the Puerto San Jose area, with biomedical engineers and doctors visiting Centro Médico Militar hospital in Guatemala City. by Kristen Wong HONOLULU, Hawaii - More than 20 Marines volunteered for Special Olympics Hawaii’s sixth annual Fueling Dreams fundraiser July 1. Each day, from June 27 to July 1, Special Olympics Hawaii chose two undisclosed gas stations statewide, offering all grades of gasoline at the same price. At the Palama Street Tesoro station, Special Olympics staff, members of local law enforcement, community volunteers and the Marines washed windows, pumped gas, and collected money from passersby and drivers on the streets nearby. Pictured: Sgt. Darryl Webb, Marine Corps Base Hawaii volunteer, receives donations from drivers during the sixth annual Special Olympics Hawaii fundraiser, "Fueling Dreams." More than 20 Marines from MCB Hawaii volunteered for the event. Special Olympics Hawaii provides opportunities for athletes with special needs to compete in sports. 07.06.2011 Story by Capt. Korry Leverett BAGRAM AIR FIELD, Afghanistan - Airmen here are spending extra time on physical fitness, not for their own personal well-being, but for service members who have sacrificed so much in Iraq and Afghanistan. Approximately eight airmen from the 455th Expeditionary Maintenance Group Quality Assurance section are taking pledges and doing pushups in order to raise money for the Wounded Warrior Project. CHICAGO (NNS) -- SEALs from the Naval Special Warfare Advanced Training Command (NSWATC) Detachment Little Creek spent the morning June 27 teaching and entertaining a highly-motivated group of young kids at the General Wood Boys and Girls Club of Chicago. The Navy visit to the club began with a brief introduction by the SEALs followed by a couple of film shorts. Shortly thereafter, Senior Chief Special Warfare Operator Joseph Jones assigned to NSWATC Det Little Creek gave a modified SEAL "Mental Toughness" presentation to the group of 75 children, ages six to 12 and then asked them if they were ready to take the SEAL challenge. HAMAHIGA ISLAND, OKINAWA, Japan — Personnel from the Camp Services Office on Camp Courtney joined members of the Okinawa community in a cleanup of Col. Kermit Shelly’s memorial site on Hamahiga Island June 22. Shelly served as the commanding officer of 3rd Force Service Support Regiment, which today is called 3rd Marine Logistics Group, from March 1967 through June 1968. During his time in command, Shelly was influential in building some of the infrastructure on Hamahiga island. ST. LOUIS - Throughout Marine Week 2011, Marines with 3rd Battalion, 24th Marine Regiment, Special Purpose Marine Air Ground Task Force Marine Week, volunteered around the greater St. Louis area cleaning up parks, visiting veterans, and assisting in blood and food drives. Taking on a different challenge, Marines teamed with 60 volunteers from the Multiple Sclerosis Society in the society’s largest project to date; making Kim Dauwalter’s house and farm wheelchair accessible. Pictured: Cpl. Matthew J. Light, a granadier with Company I, 3rd Battalion, 24th Marine Regiment, Special Purpose Marine Air Ground Task Force Marine Week, holds an 8-foot cedar log, while a civilian volunteer cuts a notch in the log so it can be used for a fence. Marines volunteered with the Multiple Sclerosis Society to make Dauwalter's farm more accessible from her wheelchair. Marine Week provides an opportunity to increase public awareness of the Marine Corps' value to our nation's defense and to preserve and mature the Corps' relationship with the American people. Tuesday, May 17, 2011 CAMP VICTORY, Iraq – Troops on Victory Base Complex participated in Operation Shear Love, in which they donated their hair to Locks of Love, May 8. Locks of Love is a not-for-profit organization that provides hair pieces to children with medical hair loss. This is the first Locks of Love donation drive that has occurred in Iraq, said Tech. Sgt. Amber Hotzfeld, an intelligence analyst, Joint Interrogation and Debriefing Detachment – Iraq, and one of the organizers of the event who donated 11 inches of hair. All of the troops, who each donated a minimum of 10 inches of hair for a total of almost eight feet, did so with their hearts going out to the children who need the hair more than they do. NAGO, Okinawa, Japan — The Nago City Board of Education recognized five Marines March 28 at the Nago Civic Center for volunteering to teach kindergarteners to speak English. Cpl. Daniel L. Burns, Lance Cpls. Zachary J. Frappier, Marcus E. Denell and Iris B. Brewer and Pfc. Antonio Diaz were recognized for their participation in the Play with English Program. They were nominated for their contributions to the program by Fumio Iha, the liaison and community relations specialist for Camp Schwab tasked with instructing local school teachers how to speak English. Video shows soldiers, airmen, and civilians participating in a remote "Relay For Life" 5K run to support the American Cancer Society in the fight for a cure. The actual race takes place in Niceville, Fla. on April 16th. 03.24.2011 By Rachel Parks FORT HOOD, Texas—Three months ago Hailey Dunn vanished from Colorado City, seemingly without a trace. Initially, volunteers poured into the town to help search for the 13-year-old cheerleader, but as days turned to weeks and then months, the number of volunteers dwindled. When Misty Moody, who grew up in Colorado City and still has contacts in the West Texas town, heard of the stalled search efforts, she knew she and her husband, Sgt. Brian Moody, could help. The Moodys shared their proposal to join in the search effort with Soldiers and spouses in the 4th Battalion, 5th Air Missile Defense Artillery Regiment, 69th Air Defense Artillery Brigade, who responded with full support. “My husband mentioned it to the guys here, and within two days, we had 28 people,” Misty said. The volunteers included Soldiers and spouses who traveled to West Texas the first weekend in March to take part in a search for the missing teen. March 18 and 19, the group rejoined the search effort. CAMP PHOENIX, Afghanistan (3/25/11 )- Being in a combat zone is a sacrifice, and leaving friends, family and other necessities at home while serving here continues to be an act of selfless service donated by thousands of servicemembers year after year. Acting by impulse to help others is a gift that military members bring to the table all around the world, and here in Afghanistan one noble act contributed by many Americans helped to save a local infant’s life. Air Force Lt. Col. John Newman, NATO Training Mission – Afghanistan / Combined Security Transition – Afghanistan, was introduced to an Afghan soldier, Faqir, who said his granddaughter, Asma, was in need of a life-saving heart surgery because of blue baby syndrome, a medical disorder where babies are born with heart conditions that decrease the oxygenation capacity. Pulling a Chinook helicopter along the ground in a race against time is not something that would normally happen in Afghanistan, but for this year's Red Nose Day RAF personnel flexed their muscles to support the cause. Three teams of personnel from 1310 Flight challenged each other to pull a Chinook transport helicopter along a 70-metre-long taxiway in the quickest time possible to raise money for Comic Relief. Two teams of engineers and one of aircrew battled against the searing heat and dust, not to mention the 16-tonne beast itself, in a bid to gain the fastest time and support the charity. PACIFIC OCEAN - Sailors and Marines aboard the aircraft carrier USS Ronald Reagan (CVN 76) collected donations on March 19 to supply displaced Japanese citizens with essential goods for survival. Ronald Reagan is currently off the northeast coast of Japan's Honshu island to provide assistance to people affected by the 9.0 magnitude earthquake which resulted in a devastating tsunami, while playing a supporting role in Operation Tomodachi. “Along with donations coming from USS Chancellorsville (CG 62), USS Preble (DDG 88) and the ships from Destroyer Squadron 15, these goods will very likely help keep people alive through winter,” said Theater Security Cooperation Officer Lt. Cmdr. Justin Harts. A team of RAF Police and their military working dogs from RAF Lyneham will carry out a sponsored march in aide of Help for Heroes and Children’s Hospice South West charities on 19 March 2011. Starting at 0030, the team will leave the new Help 4 Heroes Personal Recovery Centre, Tedworth House in Tidworth, and follow a designated route, reaching Wootton Bassett at approximately 0830, before finally completing the march at RAF Lyneham’s Dog Section. Both the dogs and the RAF Police will need to be physically fit to undertake this arduous task to complete the 37 mile march, with the policemen carrying a 20kg rucksack and a replica L85 rifle each. 03.11.2011 Story by Lance Cpl. Fenton Reese Every spring, sheep farmers harvest the white, fluffy protective coats of their sheep. These coats that protect the animals from the elements is then processed, shipped and eventually used for our clothes, boots, blankets, car seats and even military gear. On March 4, a different wooly-headed creature sacrificed his own white, and just as fluffy, hair in a special ceremony during a New Orleans City Council meeting at City Hall here. Just like the sheep in the field, retired Lt. Gen. Jack W. Bergman’s snowy, white locks were bound to be put to use for another cause. This symbolic shearing, or haircut, was in support of a non-profit organization that collects donated hair and weaves wigs for children who suffer from hair loss. Lt. Gen. Jack W. Bergman holds his freshly cut hair in a braid to be donated to an organization that will turn it onto a wig for a child with hair loss, March 4, in the council chambers of City Hall. Photo by Lance Cpl. Fenton Reese. The former Marine Forces Reserve commander retired in October 2009. Since then, he has been growing his hair for the purpose of getting it cut once it reached the length of eight inches or more. Eight inches is the minimum requirement for a donation to the organization. Christmas arrived early for two 1st Armored Division families at Fort Bliss. After nearly 15 million steps, Troy Yocum, Soldiers’ advocate and Iraq War veteran, was met by Fort Bliss Commanding General, Maj. Gen. Dana J.H. Pittard and El Paso Mayor John Cook. Yocum, his wife Mareike, the general, the mayor and mayor’s grandson Jaydon walked a mile from Fort Bliss’ Cassidy Gate to the newly-opened Freedom Crossing shopping center and post exchange (PX). 12.21.2010 Story by Lance Cpl. Reece Lodder WAIANAE, Hawaii -- Marines are imbued with a willingness to serve — from the time they swear an oath to defend their country to the time they join the fight overseas. They make sacrifices to protect their families and friends, the men and women to their left and right, and honor those who served before them. Twenty Marines recently volunteered to help those who served the country and lost so much, to try to make a difference in their lives. At last December’s Honolulu Marathon, a group of five Marines stood out among the throng of T-shirt and running shorts-clad competitors. Wearing boots, woodland utility trousers, and weighed down by flak jackets and 60 pound packs, these five Marines from Aircraft Rescue Firefighting, Marine Corps Air Station Kaneohe Bay, were not there to simply complete the 26.3-mile course. Their uniforms and a green donation box signified a mission greater than themselves — honoring and raising money for their brothers- and sisters-in-arms at Wounded Warrior Battalion West, Detachment Hawaii. It’s a mission they’ll take up again next month. MCB CAMP PENDLETON, Calif — Though most children may fear and dread receiving a hair cut, Camp Pendleton’s San Onofre Elementary School students smiled and cheered for an opportunity to chop off inches of their existing locks. San Onofre Elementary School held its second annual Locks of Love donation event in an effort to aid those who suffer from hair loss illnesses, including those receiving cancer treatments, Oct. 7. Members of three units stationed at Forward Operating Base Wright here came together, Sept. 15, to donate 13 units of a specific blood type necessary to save a badly wounded soldier’s life. While the 555th Field Surgical Team at FOB Wright had an abundance of synthetic blood products on hand, the soldier’s wounds required him to get transfusions of his type of whole blood immediately. 09.06.2010 KHOWST PROVINCE, Afghanistan – One team, one fight. It’s a phrase commonly heard throughout the ranks of soldiers across the Army. The phrase "one team, one fight" recently took on new meaning for a group of soldiers in Task Force Red Knight. The Soldiers are members of 3rd Battalion, 320th Field Artillery Regiment who found out that two of their Soldiers’ family members have been diagnosed with cancer. To make matters even worse, both family members are children. 07.24.2010 Every service member volunteered to serve and protect the United States of America, but many Fightertown Marines and sailors can also volunteer to do a little more for the community that welcomes them. Marines and sailors with Marine Aviation Logistics Squadron 31 aided United Way in their efforts to build a new home for those in need, July 12 to 14. “It is great to let the community know that we appreciate the welcome most citizens give us, and I also like seeing good people who are less fortunate have something good happen to them,” said Navy Petty Officer 3rd Class Arthur Randall II, a communication navigation technician for MALS-31. Randall was responsible for planning the event for this group to get out and volunteer. 06.09.2010 CHAPIN, S.C. – James, a 63-year-old Chapin resident, is getting some of his mobility and independence back. After having three strokes in less than a year, James can only get around with help from a wheel chair and family members, who must help him up the steps and through a narrow doorway to get in and out of his home. All this changed Wednesday, June 9. 06.05.2010 KIRKUK, Afghanistan - When Airmen 1st Class Joey Granado, a native of Dallas, and firefighter with 506th Expeditionary Security Forces Squadron, Crash-Fire-Rescue, from Tinker Air Force Base, Okla., isn't working around Forward Operating Base Warrior, Kirkuk, Iraq, as a firefighter, he is in charge of the program Operation Soccer Ball, which collects soccer balls for the children of Kirkuk. Soccer has always been a way for U.S. service members to connect with children in Iraq, Operation Soccer Ball, gives people in the states a chance to be involved in creating memories for these children, according to Airmen 1st Class Granado. The program was started in Kirkuk last year by members of the Rising Four Club, a club for junior-enlisted service members at FOB Warrior. Since then the club has collected more than 2,000 soccer balls, according to Airmen 1st Class Granado.